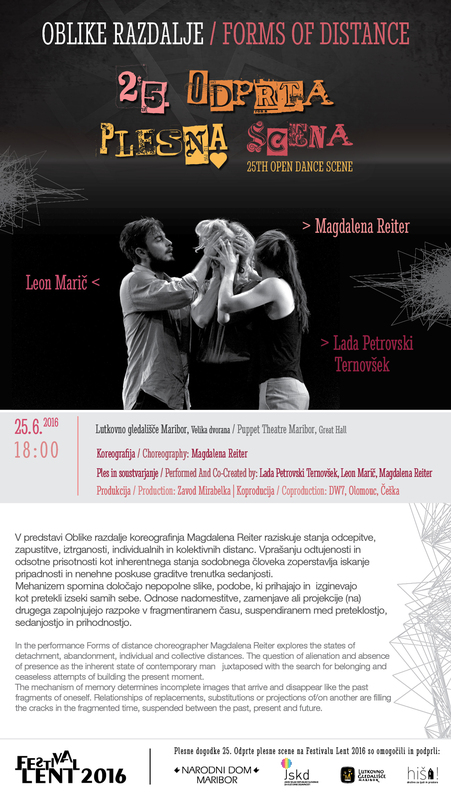 Puppet Theatre Maribor, Great Hall, June 25, at 6 p.m. The project is financially supported by the Municipality of Ljubljana and Ministry of Culture of Slovenia.The project was partly created during residency on Na Cucky Theatre, Olomouc, Czech. In the performance Forms of distance choreographer Magdalena Reiter explores the states of detachment, abandonment, individual and collective distances. The question of alienation and absence of presence as the inherent state of contemporary man juxtaposed with the search for belonging and ceaseless attempts of building the present moment. The mechanism of memory determines incomplete images that arrive and disappear like the past fragments of oneself. Relationships of replacements, substitutions or projections of/on another are filling the cracks in the fragmented time, suspended between the past, present and future.Time and event are split, the individual becomes a stranger in his own environment. Theatre -as nobody’s and at the same time everybody’s space – always a new form of distance co-created by the spectator and performer. Polish choreographer, dancer and pedagogue based in Slovenia. She started dancing as a child and graduated from the 9-years program of the National Ballet School in Gdańsk. She continued her education at P.A.R.T.S. (Performing Arts Research and Training Studios) in Brussels where she graduated in 1999. In 2000 during X-group (a program for young dancers and choreographers, initiative of Brussels 2000 and PARTS) she created her first short piece All these apropos which toured throughout Europe. After that Magdalena created 14 choreographic pieces (view:works). She was awarded the Best performance award of the international jury at the 2nd Slovene Dance Festival, Best performance award at 8th Teaterfest in Sarajevo. Her works were presented in multiple European countries (Germany, France, Belgium, England, Bosnia and Herzegovina, Albania, Poland, the Netherlands, Finland, Czech Republic and Croatia).